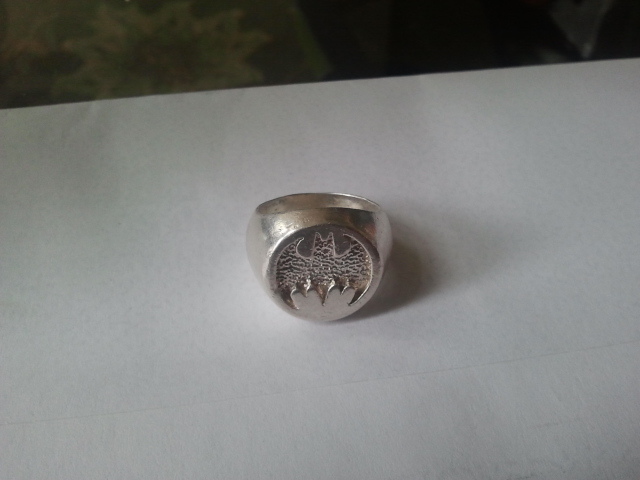 As I was digging around in my attic recently I came across a fun piece of personal history: my old Batman ring. I have always been a fan of the Dark Knight, especially in my younger days. Those who spent as much time as me at the mall in the mid and late ’90s will remember that Warner Bros. attempted to replicate the success of the Disney Store with their own chain of brick-and-mortar retail stores. Though ultimately unsuccessful, they were nerd heaven for guys like me and the merchandise was top notch. Case-in-point: the sterling silver Batman and Superman logo rings. The first time I saw the Batman version I knew that I had to have one on my finger. I waited patiently for the Christmas money to come in and, on December 27, 1996 I became a proud owner. That ring was a centerpiece to many of my high school experiences. It was a pretty classy and unique way for me to rep. my nerdness. It also served as a class ring of sorts, hanging around the neck of at least one long-time girlfriend for a sizable portion of its early life. Once I graduated high school, though, it found a long-term home in a box that resided first in my parents attic and then in my own at my current place. Until I stumbled on it last week, the last time it adorned my finger was probably well prior to 9/11. Seeing it brought back a ton of fun memories, but its appearance was not quite what I remembered. The bottom was distorted, limiting its ability to fit on my right ring finger comfortably. It also sported some nasty tarnish. I decided that such a key piece of personal history deserved better. I regret that I did not take before pictures, but if you Google for tarnished silver and imagine the bottom portion substantially flattened, you’ll get the idea. Forming the band around the socket extension. Step one was to make it round again. The widest cylinder-shaped piece of metal I found was a 1/2-inch socket extension. It was not the ideal choice, but it was all I had. Since silver is a soft metal, I decided to stay away from a steel hammer. Instead I used the hard plastic side of a non-marking mallet. It took a long time and a lot of tapping but I was finally able to reform the bottom of the ring against the extension. I used the yellow hard plastic side of this non-marking mallet. As you can see, it’s not perfect, but it actually fits on my finger again and it doesn’t have any obvious marks or imperfections that might have been left by a harder hammer. Next, though I usually like my jewelry to have an aged look, this level of patina was a little excessive, especially in the sharp nooks of the logo. I did some online research and found that many people have success using a pretty simple solution. First, line a bowl with aluminum foil. Next, dump in one tablespoon of baking soda and one table spoon of salt. Finally, pour about a cup of hot (but not boiling) water and stir until everything is dissolved. Soak the ring until the tarnish disappears. Since the reaction depends on the foil as a catalyst, turn the ring often so that different parts are in contact with it. After about 10 minutes of soaking I used an old tooth brush to remove the last residual areas of tarnish. It doesn’t look brand new, but it is as clean as I can remember it ever being. It also feels and looks good on my hand again.